Synopsis, Our Opinion: A good unpretentious Zinfandel blend. 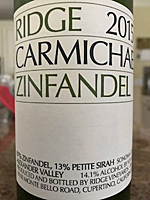 Producer/Winery: Ridge Vineyards; Cupertino, California. Grape Variety: Zinfandel blend – 87% Zinfandel and 13% Petite Sirah. Geographic Appellation,, Region, Country: Alexander Valley; Sonoma County; North coast, California. 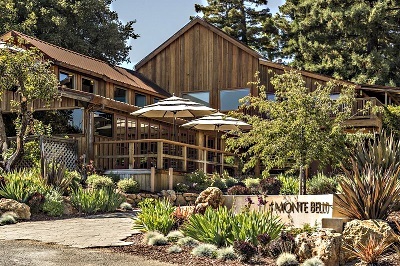 Purchased From: Ridge Vineyards Monte Bello tasting room; Cupertino, California. Paired With: Eggplant Parmesan and a garden salad. Opened one hour before drinking. Clear, garnet color with the same color rim. Ripe plum and cherry with lots of wet wood aromas. Rich fruit forward mouthfeel, medium body and a 400-grit texture. Strong jammy plum, cherry and blueberry flavors. Fresh acidity, round tannins and a long peppery spice finish that ends with a bitter note. A very different Zinfandel, good aromas, dominating fruit taste, almost nonexistent tannins, but a peppery finish that saves the ending. Although we expected a more robust wine this went well with both the eggplant Parmesan and the garden salad, but was nothing to write home about when drinking without food….we lost interest in it’s soft easy drinking fruit character. In the end we called it a good unpretentious Zinfandel blend. Comments: Learn more about Ridge Vineyards and their wines. See also our reviews of other Ridge Vineyards wines. UPC Code: 7 44442 85100 3Not available.